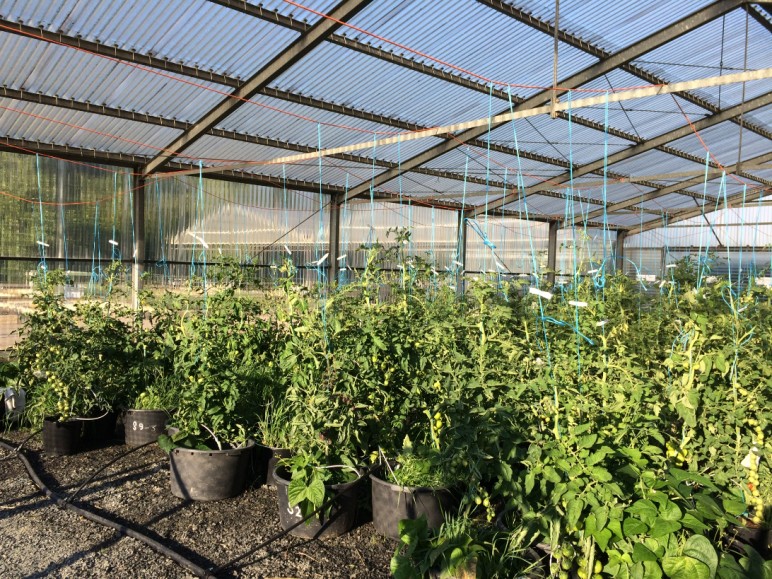 Rough experimental design: Comparison of the yield quantity and quality of organic and conventional tomato and bean varieties under weed pressure. Cultivation as a bean-tomato mixed crop (in PE mortar tubs) and as individual plants (in pots) for comparison. October 2018, autumn has finally arrived here in Göttingen and I left my plants last week with a heavy heart. For almost 6 months my almost 400 “children” were an integral part of my daily work and in my thoughts when I was not here. Despite the very hot weather, almost all beans and tomatoes did well. The harvest season started this year on 19 June with the first beans. The harvest went really well for 6 weeks, until suddenly the spider mite pressure became too strong. After these 6 weeks, the first tomatoes ripened quite fast and I stopped with the bean harvest, because they became weaker and weaker quite fast due to the mites. 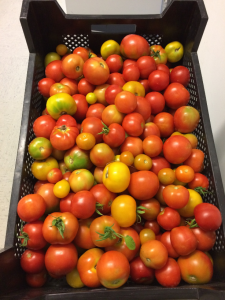 However, the good weather and the hot days made sure that the tomatoes ripened quickly and felt comfortable with sufficient irrigation. Nevertheless, I also noticed that the very hot days this summer have also stressed my plants extremely and the harvest in the two extreme weeks was noticeably worse. In order to spare the plants after this extreme time, I almost completely stopped pinching and pruning them from September on and only occasionally made sure that the plants kept a structure where you can harvest well. In my opinion this has done the plants a lot of good, they have recovered well and have started again full of energy. My experience is that pinching and pruning is often used to its fullest among hobby gardeners, but it is probably good for the plants (like all other living beings) if you just leave them alone and do not always cut something off “here and there”. 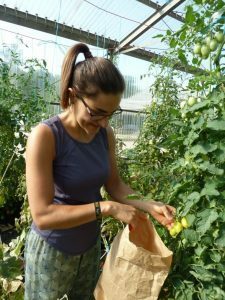 The exact composition of the harvest – whether there were differences between the organic and conventional variety groups and how the mixed cultivation of bean and tomato plants in a tub had an effect on the harvest and quality of the fruit – remains interesting and will be shown in detail in the statistical evaluation, which is still to be carried out. Finally, I would like to thank all the lovely people who have accompanied and supported me in advance and over the last few months with their expertise, muscle power and creativity. Without the gardeners in the new Botanical Garden here in Göttingen and my student colleagues I would certainly not have become such a proud mother of plants!